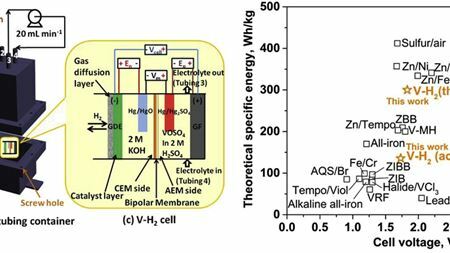 Rechargeable vanadium-hydrogen (V-H2) flow battery could be simplest option for renewable energy storage. Paradoxical symmetry in metallic nano-alloys. Boride nanowires deposited on carbon fiber cloth could form the basis of high capacity, stable supercapacitors for energy storage devices. A new technique can create an individual fingerprint of the current-carrying edge states occurring in topological insulators or 2D materials. Scientists have synthesized a novel organic/inorganic hybrid 2D material with promising electrical and magnetic properties. As much as 100 times more heat than predicted by standard radiation theory can flow between the edges of two very thin semiconductor plates. Scientists have induced a two-dimensional material to cannibalize itself for atomic ‘building blocks’ that go on to form stable structures.